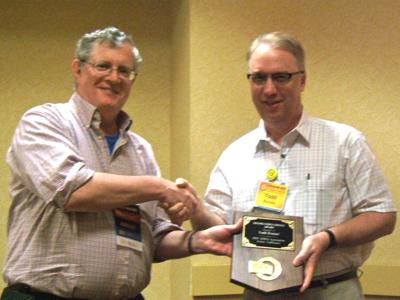 At the AFDCS Membership meeting held on August 12, Todd Ronnei received the AFDCS Distinguished Service Award (DSA). This is the AFDCS's second-highest award (only Honorary Life Membership is higher), and the DSA honoree is selected by a committee composed of all prior DSA recipients. President Lloyd de Vries presents DSA to Todd Ronnei. 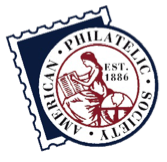 Our honoree began collecting stamps when he was given a stamp collecting kit for Christmas in 1970. A few months later the first day cover collecting bug bit him when the 7-1-71 FDCs came on the scene. The year after that he serviced his very own FDC by sending an envelope and 16 cents to Cape Hatteras for two blocks of the National Parks Centennial issue on cover. Our awardee began as a cachetmaker in 1991 when the Hubert Humphrey Great Americans stamp was issued in his hometown of Minneapolis. He not only designed and printed his first cachet but drove several hundred miles to obtain unofficial cancels for this issue. Currently he is a gold-medal FDC exhibitor. He is active on the Virtual Stamp Club message board and has published in Stamp Collector and Scott Stamp Monthly. In October 2009 he launched a totally revamped web site for AFDCS that included easier navigation for the fund-raising auctions and a secure online payment system. His services as webmaster are at no cost to the Society. His latest project has rendered an invaluable service to the hobby AND the Society by scanning the complete run of First Days and preparing a digitized searchable PDF version for which first day cover researchers will always be indebted to him. He became a member of the Board of Directors in 2009 and is current Chairman of the Board-Todd Ronnei.